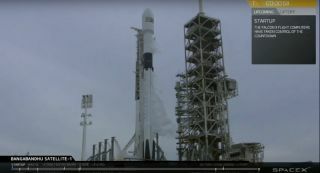 SpaceX's first "Block 5" Falcon 9 rocket and its payload, the Bangabandhu-1 communications satellite, stand poised to launch on May 10, 2018. An automatic abort was triggered 58 seconds before liftoff, pushing the launch back at least a day. The Block 5 was upgraded to meet NASA's crew-carrying requirements; SpaceX will use the rocket to launch agency astronauts toward the International Space Station (ISS). SpaceX holds a multibillion-dollar deal with NASA to perform such taxi services, as does aerospace giant Boeing. The Block 5 also features a series of improvements that should significantly boost its reusability. Whereas the first stages of previous Falcon 9 iterations have launched a maximum of two times, the Block 5 first stage will be capable of 10 orbital flights with just inspections between liftoff and landing, and perhaps 100 or more with some refurbishment involved, SpaceX founder and CEO Elon Musk said during a teleconference with reporters yesterday. Musk said that the Block 5 is designed to be the most reliable rocket ever built, and that he's confident in the vehicle's long-term prospects. But the vehicle's maiden flight is causing him some anxiety, he added. "You know, it could be a thousand things that go right on this rocket, and one that goes wrong, and a passing grade for rockets — the reason that it's so hard to make an orbital rocket work — is that your passing grade is 100 percent," Musk said during yesterday's telecon. "And you can't fully and properly test an orbital rocket until it launches, because you can't recreate those exact conditions on Earth. Everything's sort of a proxy for traveling hypersonically through a vacuum. Yeah. Man. Anyway, I'm stressed." He added this last bit with a chuckle, then told the reporters that "any good wishes would be appreciated." Bangabandhu-1 will be Bangladesh's first satellite. The spacecraft was built by French company Thales Alenia Space, and the government of Bangladesh will use it to provide a variety of communications services to its citizens.